BRACEBRIDGE, ON – Muskoka Brewery has announced details for the latest edition of its semi-annual mixed six-pack. The Summer 2019 edition of the Survival Sampler Pack features 473 ml cans of two seasonal beers – Camp-Out Pils (4.9% abv, 30 IBU) and Summerweiss Tropical Wheat (5.3% abv, 13 IBU) – alongside year-round brands Craft Lager (4.8% abv, 13 IBU), Detour Session IPA (4.3% abv, 30 IBU), Ebb & Flow Session Sour (2.4% abv, 5 IBU), and Cream Ale (5% abv, 20 IBU). 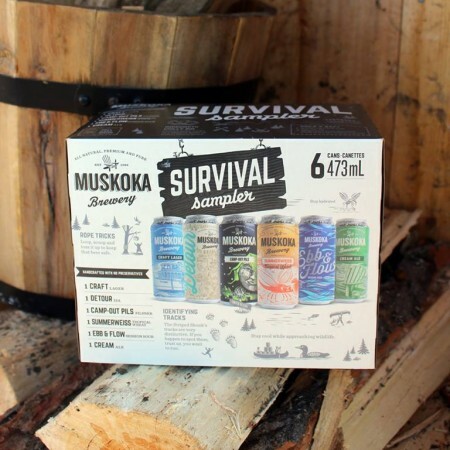 The new Survival Sampler Pack is available now at the Muskoka retail store and online shop, and soon at select LCBO, Beer Store, and grocery store locations in Ontario, as well as beer retailers in Alberta, Saskatchewan, Newfoundland, and New Brunswick,. Summerweiss will also be sold separately via the brewery/online plus retailers in Ontario, Alberta, Manitoba, Newfoundland, and New Brunswick, while single cans of Camp-Out Pils will be available exclusively at the brewery and online shop.